One of the really cool things about building this website is that it has allowed me to connect with lots of people thinking about getting into vermicomposting and then helping to nudge them further in that direction. It is especially gratifying to receive emails from some of these folks weeks and months later, telling me about all the cool vermicomposting projects they have on the go etc. My vermi-friend Mark (aka “Mark from Kansas’) is certainly a PRIME example of what I’m talking about! He bought worms from me back in February (and again in March), and is definitely someone who has taken to vermicomposting like a fish to water! In all honesty, Mark’s email updates have inspired me so much I’ve almost resorted to begging him to become a RWC correspondent. Well, all my whining and pleading seems to have paid off (haha), and I am very pleased to be able to share Mark’s first ‘official’ post here today – focused specifically on his new OSCR (Oregon Soil Corporation Reactor) worm composting system. Included here is a bit of a background story, Mark’s OSCR-building journal entries, and a gallery of pictures taken during the set-up process. Each photo has it’s own caption, but you may have to look closely to read them since I needed to shrink the images so they’d fit in the post. I like to experiment with the whole vermicompost concept. I have had a lot of success vermicomposting so far. The Rubbermaid bin seemed like too much labor to harvest and maintain. I had, at one time, 4 Rubbermaid bins and one 55 gallon drum (cut length wise) in my garage. They were in the garage for four seasons and all of them prospered. For 12 months I fed them all kinds of things just to see what would happen and made a list of what they would eat. To make a long story short, I had 5 bins with different foods different moisture content, or different temperatures. If I killed some I would not kill them all. The vermicompost I did harvest was great for our plants. Some plants grew well in sand and other plants did well in what was mostly gravel. My wife used some VC on her tomato plants and from casual observation, they were bug and disease free. She was very pleased with her small crop and received several compliments on the taste and juiciness. So, I finally decided to lay all my cards on the table. I have read volumes of research and spent more money than I wanted to. Living in Kansas, I have an unlimited amount of manure and coffee grounds. I keep track of how many pounds of coffee grounds I get from the gas station and put up a sign in the store stating how much the store has recycled. The sign is a public awareness tool. They sell more coffee by going green and I get the coffee grounds. My goal for this year is to reduce the bin input by 90%. I am trying to reduce 1 ton of trash into 200 pounds of high quality VC. I send samples to K-State University for nutrient contents, N P K. Some of the previous values varied greatly and now I think I have a good mix of food to balance out the values. It is my understanding that N P K are non renewable resources, they have to be mined or made from fossil fuels. I make them in my garage. The guy I get my horse manure from wants to go completely organic in his huge garden. I think it is a fair to trade manure for VC for him to till in his garden, I’ll let him do the growth trials on a large scale, that will free me up to do more research. I chose the OSCR bin type to meet my needs. Less labor and more time to observe and record. It does have a forty watt heater cable in it that – based on an electric consumption calculator – will cost me 10 cents a month. I have been criticized for leaving a “carbon footprint” and using electric to heat it wasn’t pure vermicomposting. Personally, I think we are in a natural resource and pollution crisis. Time has run out a long time ago to start doing something now, if I have to maintain my bin with electric, then I have to. If all my worms die, I have no worms to vermicompost and have to spend even more money. I also decided to install a 4” fan to force air into the harvest chamber, in short, I want to pressurize the harvest chamber to force air up and have the bottom 2” of the bin on the dry side. I am getting ready to start the new big bin 40” x 48” x 24”. The heater cable was a little long so I angled it upwards to 10” because the heater cables can‘t touch each other. The breeding chamber itself is 4” deep The breeding chamber is defined as: the harvested VC from the other bins which I have witnessed as having a lot of cocoons. The main body of the heater cable is 4” above the steel cable screen. So from the bottom: steel cable, a layer of news paper (2-4 sheets thick), the harvested VC that include cocoons, and the main body of the heater cable. I want the “finished” VC at the bottom so the heat will hatch the cocoons. The bulk of the food at the top will drive them upward. I have a Bentley Bin* inside for the harvested worms. I am going to have to start a second BB when I harvest the rest of the blue bin. It is cold outside and I am going to have to let the reactor bin sit for at least a week to let it warm up and stabilize before I add the worms. Letty plugged in the heater @ 7:00 pm. The temp of the bin is 42 degrees. I’ll have to wait for at least a week for the temp to go up to70 degrees. The wait period will also stabilize the contents, once stabilized I’ll add the worms. Temperatures vary from zone to zone. The temp is 56 degrees within a 20 inch radius from the center, at a depth of 4 inches. The left side of the bin had temps in the mid 60s. I sprayed down the top with 1 gallon of water. The moisture meter was reading 20%. Temps rising in various zones. I closed the harvest door and have a temp 8 degrees above ambient. Added 2 ½ gallons of water. Added 8 pounds of horse manure. The surface seemed like it had to much coffee grounds. Added ½ gallon of water. I went ahead and added my small holding bin of worms and unfinished VC 24 lbs. The small bin was running a little dry so, in they went. I estimate 6 lbs. of worms. I also watered it down with ½ gallon of water. I have pot worms crawling up the sides. Added 4oz of bread to the right side. I went ahead and added the other holding bin 43 lbs. of worms and unfinished VC. I have no idea how many worms were in the 43 lbs but, there was a lot. Maybe 15 lbs. Cow Manure 2 ½ lbs. Worms holding bins 77 lbs. Let me wrap this up by sending out a big thanks to Mark for taking the time to document his OSCR building experience (and of course for sharing it with us). Hopefully he will be able to provide us with updates as the bin (and his vermicomposting adventure in general) progresses! If you have any questions or comments for Mark please be sure to add them below! Well, it’s been a little while since my last Worm Inn Pro update. Certainly a few things to report on there. As you may recall, in my typical over-confident (a.k.a. “dumb”) manner I decided that I was basically going to overfeed this system even though I only started it with a couple bags of ‘compost ecosystem’ mix (i.e. no gobs of worms). I assumed (like a typical dummy) that given all the fantastic air flow, along with the healthy amount of shredded cardboard I’ve been adding, I could get away with anything, just shy of pouring in rat poison! Luckily, before too long I realized that this foolhardy approach wasn’t the best way to go – for the first time ever I actually ended up with leachate coming out of the bottom of a Worm Inn, and there was a fair amount of stinky anaerobic stuff going on with all the food waste I had added. As such, I cut back on my proposed feeding schedule, and have only added food once or twice since then. What’s really cool is the fact that despite all this, the system has still remained relatively odorless (and trust me, I’d hear about it if one of my systems start to stink – especially given the fact that my Worm Inn is sitting in our laundry room). When I dig down into it with my trusty hand fork I definitely get some less-than-pleasant odors wafting up (due to all the anaerobic pockets I am disturbing), but I’m certainly not dealing with the kind of catastrophy that would almost certainly be occurring if I was doing this in an enclosed plastic tub. I should also mention that the worms are doing very well. Now when I dig around I am seeing a lot more worms (large and small), so the population is clearly doing just fine despite my best efforts to be a bad caregiver! Interestingly enough (yet not surprising at all) some other critters have made their presence known in a BIG WAY, basically taking advantage of the relatively low competition environment. This is actually kind of cool since I wrote about this sort of thing not too long ago in the newsletter, and my last blog post also dealt with a couple of these organisms. I think I already mentioned there being lots of springtails, but for the first time today I noticed there are also a LOT of white mites. This is really interesting to me since this is the first time I have seen so many in an open system. Clearly, my excessive overfeeding is providing them with some nice living conditions! I can only imagine how many there would be if this was a dark enclosed tub – as it is, they are only concentrated on wet food materials. Another dumb move made by yours truly recently was to bring in a culture of large-bodied fruit flies (yes, on purpose! haha) from outside. I had been growing them out in my shed with the plans to test out my ‘mosquito dunk’ theory of dipteran destruction (ie. I wanted to see if it would kill various worm bin ‘fly’ species). Its been getting pretty cold the last little while, so I wanted to make sure I still had some to play around with. Of course, as ‘dumb’ as I call myself I knew full-well that the likelihood of keeping the fruit flies contained once inside was slim to none. True to form, it was only a day or two before I found them in one of my open tray systems – and from there is was just a hop, skip and a jump over to the Worm Inn. As mentioned, this system is much better than the original at fending off some invasions due to the zippered lid – but its one ‘Achilles Heel’ is the small open space where the two zipper sliders meet. I tried to tape it up, but the tape I used didn’t hold, and I suspect that some may have managed to get in before I even put the tape on. What’s really neat about this current fruit fly ‘invasion’ (if you can call it that) is that it’s still not obvious. They don’t seem to thrive all that well in my open tray systems, and the Worm Inn is really great at keeping them contained – I didn’t even realize there were all that many in there until I finally opened it up today to take some pictures (so yeah, I might not be doing that again for a little while – haha). Anyway, as you can probably tell, I love pushing the limits with my systems so that I have things to write about here on the blog – and of course, I also like to remind people that I am a normal, average worm guy who gets fruit flies and mites too! White Lice in My Worm Bin? white insects in my trays–are they harmful and what are they? There are a number of possibilities here – first and foremost however, let me assure you that these critters are definitely NOT any sort of lice. The only type of ‘lice’ you might find in a compost bin are ‘Woodlice’ (a.k.a. ‘Sow Bugs’, ‘Pill Bugs’, ‘Basketball Bugs’) and they are not really lice. Heck, they’re not even insects for that matter (they are crustaceans – much more closely related to crabs and shrimp than bugs). Formerly thought of as a prehistoric insect group, I’ve just learned from Wikipedia that these creatures are no longer actually considered insects at all. Regardless, they are a very common invertebrate found in compost heaps and worm bins (among numerous other habitats). As the name implies, they usually have a spring-like tail appendage known as a ‘fercula’, but interestingly enough some of the common varieties found in composting environments don’t seem to have these. Springtails, like composting worms, feed heavily on microbes – especially various types of fungi – so they are generally beneficial in a composting system. Some people claim that they can irritate the worms when very abundant, but I personally don’t worry too much about their presence my my own systems at all. In fact, they really seem to help break down waste materials – and in particular, seem to be a valuable asset in terms of keeping fungal populations in check (so less likely to see molds etc taking over your bin), and for taking care of wastes that the worms might not be as eager to feed on (such as citrus, and structurally resistant materials like broccoli etc). There can be a huge array of different mite species – even within single compost ecosystem environment. One of the more common varieties found in worm bins is what I refer to as a ‘white mite’ (I am still not sure if this is one species, or a number of similar species). People often assume these are ‘eggs’ – in fact many vermicomposting newcomers wonder if they are ‘worm eggs’ – since they are white, shiny, round, and don’t appear to move at all. If you watch them for long enough however (or use a magnifying class) you will realize that they do indeed move, and that they possess a short set of appendages to assist with their locomotion. As is the case with springtails, the presence of these critters in your worm bin in itself is definitely nothing to be concerned about. If you are seeing massive quantities of them however (coating the sides and underside of lid – perhaps even coming out of the bin) then it may indicate that you need to make some adjustments so as to better optimize conditions for the worms. In my experience, mites (and these mites in particular) really thrive is wet conditions where lots of excess food is available. They also seem to do well in acidic environments – quite some time ago, I wrote about how one of my bins (fed too much bokashi waste) went ‘sour’, and one of the symptoms was a huge abundance of these mites. 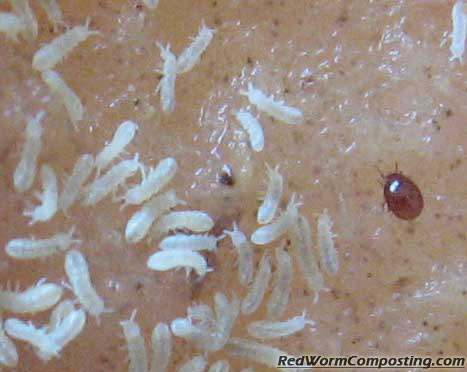 People often assume that these mites actually attack and feed on worms since quite a few can sometimes be found on the worms themselves. Based on my own experiences with this phenomenon, I feel that yes, they do sometimes feed on worms – but in every single case, I’ve observed that the worms were either dead or dying. I suspect, therefore, that these mites serve as general scavengers in worm bins, performing a valuable clean-up role when the need arises. This is yet another reason to keep your eyes open for these white mite population explosions – they can sometimes indicate that something is going wrong with your worm population (likely due to environmental conditions in the system). Anyway, Geri – I hope this helps! If you still think your white critters might be something else, please do provide some additional details and we’ll see if we can further narrow down the possibilities. This last week or so has definitely been a bit of a wake-up call in terms of reminding me that winter is just around the corner. The mercury has been dipping well below average for this time of year, and I’m starting to feel a wee bit anxious about getting my outdoor worm beds ready for their winter slumber. Interestingly enough, I have also been receiving a fair number of email questions relating to the topic of cold weather vermicomposting in general. I’ve certainly written quite a lot about ‘Winter Worm Composting’ – namely my ongoing pursuit of the ultimate (active) winter worm bed, but I wanted to write this post to outline some steps you can take if you want to simply protect your worms until spring. (by the way, you can learn more about my Winter Worm Composting adventures via the links on the ‘Hot Topics‘ page). That’s right – there is a BIG difference between keeping an active winter system and keeping your worms alive! Red Worms and European Nightcrawlers are very tough worms and seem to be able to survive any amount of cold…so long as they don’t freeze solid, that is! As I think I’ve written before, last year when I was transferring material from my former winter worm composting bed to the new system (of course, after procrastinating until there was snow on the ground!) I actually found wiggling worms in partially frozen material! There’s a fine line there, however! Back when I was a vermicomposting novice I set up an improperly insulated system in my dad’s backyard and it froze solid, basically killing off my entire population! (DOH!) I should mention that worm cocoons are a fair bit more cold-resistant than the worms themselves, so even if all hope does seem to be lost you may end up surprised to find a population of young wigglers once the bed/bin warms up again in the spring! When it comes to fall (outdoor) worm bed maintenance (i.e. making sure you’ve got loads of worms left for next spring) there are basically three main strategies I recommend – 1) Consolidation 2) Protection, and 3) Insurance. It’s not a bad idea to focus on them in that order as well. As the name implies, this involves concentrating as many worms (+ habitat and food) as you can into fewer key systems. This is not to say that you should completely abandon the systems the worms are being moved from – with a minimum amount of effort you might be surprised how well these ‘neglected’ systems still do. Take my main vermicomposting trench for example – last winter I moved a LOT of material (and worms) from it over to my sandbox garden bed (which was then insulated with straw/leaves and covered with a tarp). I literally did nothing to further protect the trench itself, other than allowing snow to pile up in it! In all honesty, I had zero expectation of there being any worms left in it by the time spring rolled around. Long story short – I added some wormless manure to it late in the winter, and found the material to be loaded with worms (and I’m not just talking about newborns here) not too long afterwards. Consolidation is still a good idea though, since it allows you to put a lot more focus on a handful of (or even one or two) systems. Unless you have access to heaps and heaps of manure and/or protective bedding materials, it probably won’t make all that much sense to fully protect every last nook and cranny of your outdoor (warm weather) systems – especially if you are like me and have a vast array of different vermi-projects on the go in your yard. It’s kinda like painting your house (uh oh, Bentley’s analogy engine is kicking in! )…would you rather use a can of paint to do a really great job on a few rooms, or stretch it out for the sake of having the whole house painted (shoddily)? As mentioned, it certainly won’t hurt if you do at least add a little protection to your leftover systems as well – maybe a shallow layer of leaves, grass clippings or yard clean-up waste. I should mention that this is really only applicable of you have systems that are in-ground or at least pretty low to the ground. If you have ‘regular’ worm beds, and it gets really cold where you live, you will definitely want to move most of your worms indoors, or create some low-lying protective beds (again, with more effort being placed on fewer systems). My major consolidation activities so far this year have involved removing as much material as possible from my various small and/or shallow systems (such as my vermi-mulch gardens, and my potato boxes) and either harvesting the worms for sale, or moving everything to one of my planned winter beds. At some point I will also more than likely be moving a LOT of material/worms over to my large winter worm bed (over at my dad’s place). This is obviously more important than consolidation (although, consolidation as actually a form of protection in its own right) – if you take the time to concentrate your worm herd but don’t offer them any protection, you end up relying primarily on the worms’ ability to cope with the cold. With ‘sleeping’ winter systems it’s actually very easy to provide protection, even in extremely cold locations. As mentioned already, one of the keys is making sure you are using fairly low-lying systems – with something like a vermicomposting trench or pit being your best option. The earth itself provides excellent insulation from the cold, and keeping the system low to the ground also helps to reduce the impact of ‘wind chill factor’. Once your low lying system is in place, really all your need to do is then add as many layers of ‘stuff’ as you can – the more the better. I’m in the process of cleaning up my gardens these days, and rather than tossing the material into my backyard composters (as I would often do with weeds etc during the summer), I’ve been laying it down over top of my trench beds (in the picture above you can see all my chopped up zucchini plants now serving as an initial layer of protection (and potentially even food) for my main trench. Unlike during the summer, when I was trying more to optimize the systems, I’ve basically adopted an “anything goes” kind of approach, short of tossing in my non biodegradable garbage of course! It’s during the cold weather that the “structure’ materials, such as straw, fall leaves, bulky plants etc can really come in handy – not only providing insulation, but also a long-term food source. One important thing to mention here though – if you are planning to add some good ‘food’ materials as well, it’s not a bad idea to make sure you are adding a healthy layer of the protective materials over top. Let’s say for example that you happen to have access to large quantities of aged manure and plan to bulk up your beds with it. While, this is certainly a fantastic winter strategy, one thing to keep in mind however, is the fact that the worms are likely going to move up into it. Unless you also have a really nice thick layer of insulation materials on top, you can still run the risk of killing off a significant proportion of your population. While I certainly won’t do this with my trench systems, it’s also not a bad idea to add some sort of semi-breathable ‘shell’ over your beds to create an extra layer of wind (and rain) protection while also helping to keep some microbially-generated heat in. I’ve found that a regular tarp can work very well, but if you want to get super fancy I know there are various commercially available compost covers as well. As I mentioned earlier, I used a tarp as an extra layer of protection on my sandbox bed last winter (also on my big winter worm bed). Apart from the protection these covers can offer, they can also be quite helpful for warming up the bed in the spring (assuming they are a dark color) – just don’t leave them on too long!! When it comes to vermicomposting (especially when just starting out), it is NEVER a bad idea to have an ‘insurance policy’ bin (or bins), just in case something goes really wrong in your main system. Well, the same principle applies here. If you live in Alaska, Northern Minnesota or any other extreme winter locale this is especially important! Even if it simply involves setting up one or two tiny bins in your basement, bringing your worm composting efforts indoors is a good way to ensure that you will be able to kickstart your outdoor systems again once spring arrives. Of course, keeping indoor worm bins has plenty of other advantages apart from preservation of your worm herd! It’s nice being able to continue composting your food scraps during the winter, its obviously advantageous if you own a worm business and still plan to sell worms, and of course who could forget the fact that keeping indoor worm bins is just plain FUN! So there you have it – my basic approach to getting my worms ready for the winter months ahead. As per usual, if you have any questions or experiences to share be sure to leave a comment down below. Just so you know, I will also be writing more about the topic of cold weather worm bins (apart from getting back into my ‘Winter Worm Composting’ series) fairly soon – so do stay tuned! that I never knew I needed to know!! Your logic is certainly on target here – different scientific names should indeed indicate a completely different species. Given the fact that we are talking about different genera altogether (Eisenia vs Dendrobaena), makes it all the more likely that we are talking about very different worms! As fantastic as scientific ‘binomial nomenclature’ is, unfortunately from time to time those pesky scientists throw a wrench into the system and mess things up! As annoying as these discrepencies can be, it is really important for the scientist to make the change since it helps group organisms more accurately moving forward. Unfortunately there is no ‘CNN’ for mundane scientific news (like name updates) so this info doesn’t exactly go mainstream once it is announced! As such, these older names can end up lingering for quite some time. What interesting about this particular case (and something that definitely does not help!!) is the fact that the Dendrobaena veneta name is still very widely used in Europe for some reason, while the new name has gained a lot more acceptance over here in North America. Anyway, the bottom-line here Erika is that ‘YES’ I have been using Dendros and Euros – but only because they are one and the same! are gone and have been replaced by earwigs and black widow spiders! in San Diego, CA which has a mild, Mediterranean climate. There are certainly some additional details about your situation that could help to shed some more light on why this might have happened, but I’ll still discuss the topic of “disappearing worms” in general to provide everyone with a broad overview. Based on what you said, I suspect that your system has been sitting outside (it would be bad enough that you have ‘Black Widows’ in your yard, so I certainly hope you are not talking about an indoor system!!). Almost invariably, the ‘disappearing worms’ phenomenon seems to occur in outdoor systems – and this is not really too surprising when you think about it. Indoors, it is much easier to keep your worms protected from weather extremes, predation etc etc. Another factor that almost always seems to come into play is some sort of ‘neglect’. Now don’t get me wrong here, Charles – I’m not trying to suggest that you were a bad ‘worm daddy’ (haha)! All I’m saying is that it is pretty hard for worms to vanish without a trace if you are constantly checking on the system (unless they are abducted by aliens – and we can never rule that out completely!). Worms DO decompose very quickly, but you would still see some evidence of dead worms or at least a declining population over a given period of time. A common example seems to be when people go away for a holiday etc and come back to find the worms gone. There are certainly plenty of environmental factors that can come into play here. Was there a hot spell? A cold spell? Lots of rain? A drought? Any one of these could have a negative impact on an outdoor system – especially if it is fairly small. I actually just received an email from one of my readers, telling me how he lost most of his worms during a period of heavy rain. If worms are able to easily escape from a given system, and conditions in said system are not ideal, they certainly won’t hesitate to move – especially during dark, wet periods. The fact that you found spiders and earwigs makes me think that you might be on the other end of the spectrum – perhaps the system dried out? If, on the other hand all this this DID happen within a matter of days (and if you’ve been feeding them on a regular basis still), and if there hasn’t been any rain or extreme weather – then we may have a bit of a mystery on our hands!